Couple questions but mostly LGTM! // PullRequestWithContext contains a pull request with its latest context. // Context holds graphql response data for github contexts. Why use the githubql types if we have to coerce into them anyway? equality.Semantic is useful for k8s types and adds a level of semantic meaning to the checks, which isn't (?) appropriate for these types. was reflect not working? Possibly when the github context is knowably older than the prowjob state, EG github is still showing yellow but we know the job finished and is passed/failed (I don't think we can trivially detect this right now, but maybe in the future). Even then the inconsistency probably makes this not worth it. I'd also say having some way to detect the source of the state would be helpful, maybe we can mark them with the github / prow logos? Or in the future the avatars of the account posting the status + some other icon when it's just a prowjob state. Can you explain more about those points? I see. 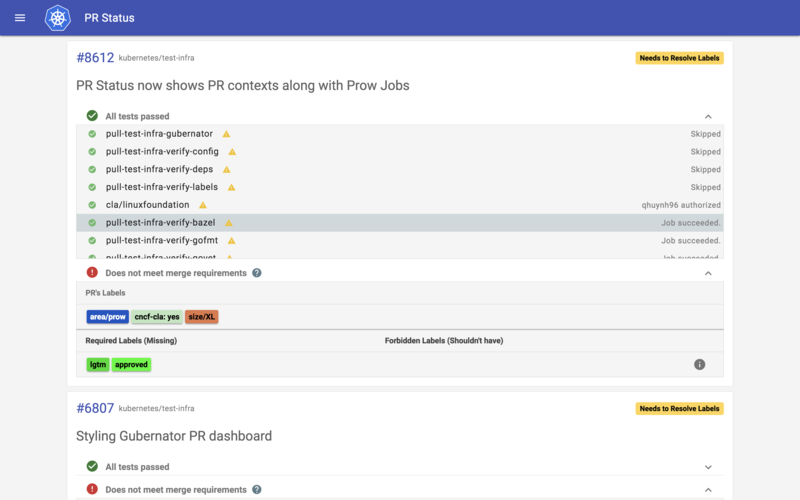 For your second point, our deck couldn't update data in real-time which means that users must refresh the page to see fresh info; therefore, by the time they refresh, Github contexts may already up to date with Prow Jobs. But I still dont get why we prefer Github contextes over Prow Jobs. Got it. I can see it will be a very rare case that Prow Job would be used; how about displaying github contexts only? bump, I think this makes sense with some hover text, can we get rid of the black behind the icon? in example screenshots, is the CLA the github status that's new and added by this PR? Yes. And not only CLA but all of the contexts above are Github statuses as ProwJobs were expired already.